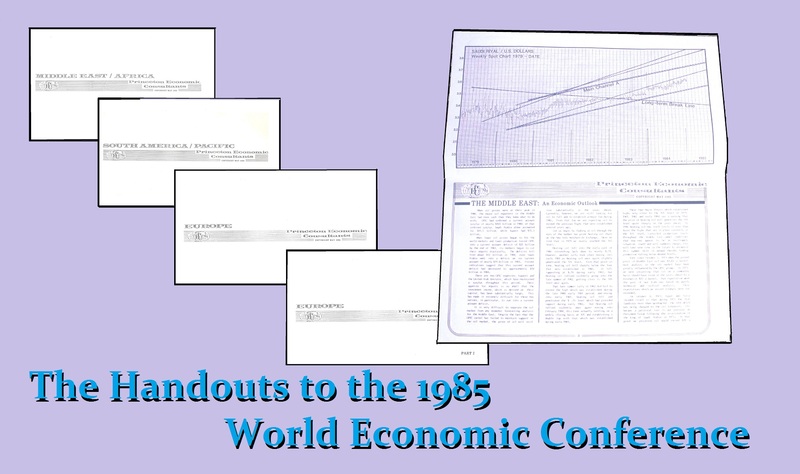 We have recovered a set of the 1985 World Economic Conference materials. This was a major institutional event held in Princeton, New Jersey. The materials included all major markets as well as major economic statistics covering North America, South America, Middle East, Asia, and Europe. The importance of these materials was the forecast for a dramatic rise in volatility – precisely what we warned the White House on at that time. Their reply was that we were the only firm with such a global model and until someone else concurred, they could not rely upon just one model. Well here we are nearly 30 years later and there is still no other global model. This forecasting conference became renown for the attendance was global with governments sending representative from the Middle East to Asia. The capital flows could be seen in the room itself. It was truly a financial United Nations type gathering. The handouts from the 1985 World Economic Conference illustrated the sharp increase in volatility that we would face that has proved to be an understatement. You will see charts and forecasts for the Saudi Ryal, Turkish Lira and South African Rand just to mention a few currencies long before they were normally even regularly quoted.This is when we were forecasting back then when the Dow was 1,000 that we would see an exponential move to 6,000 that began the start of the Takeover Boom. This was the new Takeover Boom that some have blamed on this event because we were warning that stocks were in real terms back at Great Depression values. 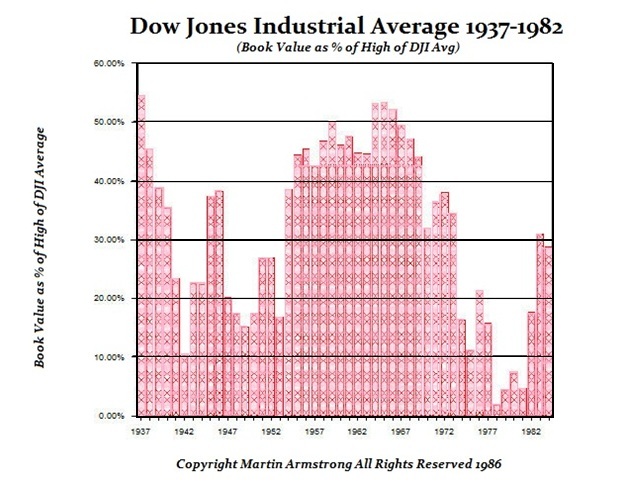 This is the famous chart that exposed the severity of the undervalued US equities at that time. 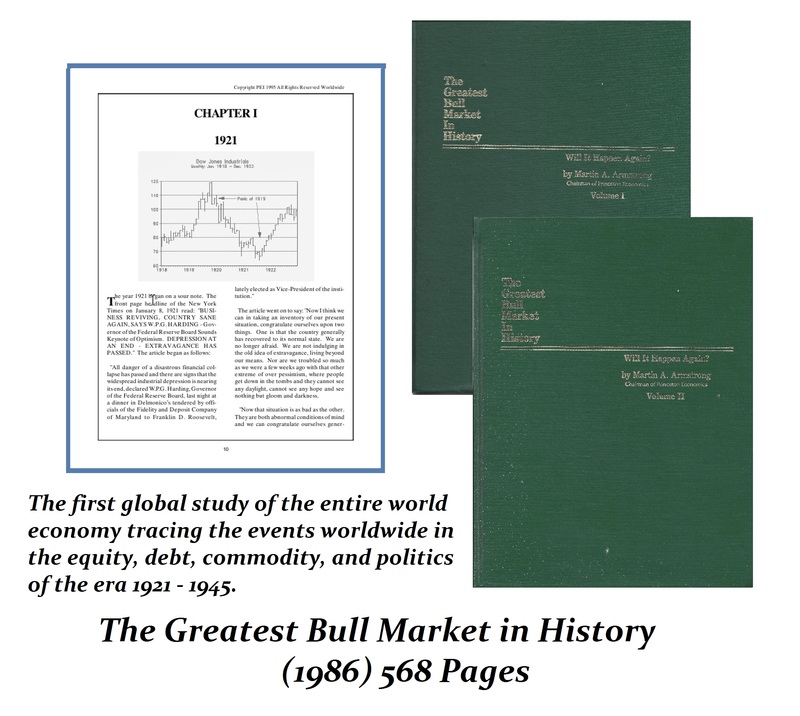 This was the World Economic Conference when we provided a review of our global correlation models that was followed the next year (1986) with the first publication of such a global correlation by the publishing of the Greatest Bull Market in History. This work has been recently updated and expanded by more than 500 pages. This will be available soon before year-end. Our offices at the time were still only Princeton, London, and Geneva. We had not yet opened in Japan, Hong Kong and Australia. 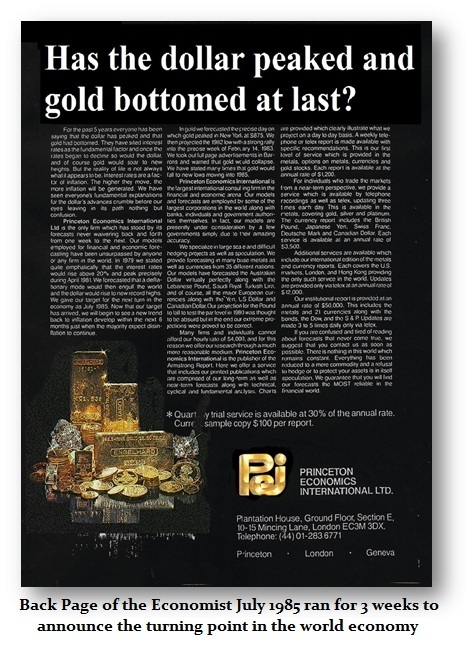 We took the back page of the English magazine – the Economist – for three week in July 1985 to announce that our Economic Confidence Model was forecast the end of the recession and the birth of a new era. 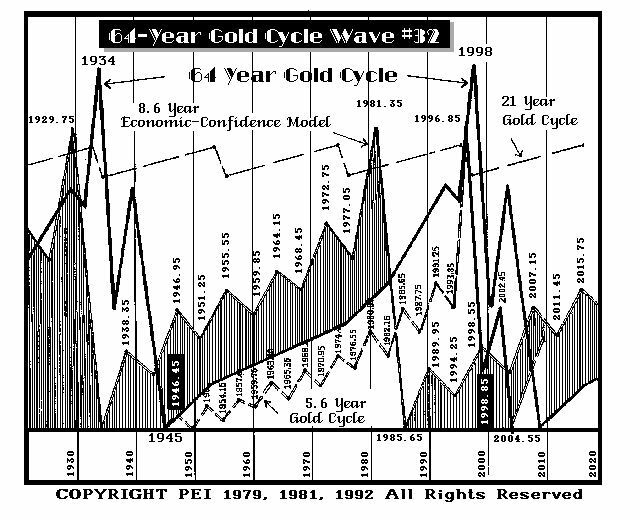 Even our model on Gold was projecting a 64 year cycle that would conclude in 1998. Indeed, that was the reciprocal low as was the case in 1934. The intraday low unfolded in 1999. From that target onward, gold has risen and it is not because of fake bars in Fort Knox, or fiat currency, but the plain old fashion Sovereign Debt Crisis that a three year old could predict with a pocket calculator was inevitable.